Like all Irwin’s other Quick-Grip clamps, you can convert the XP600’s to spreaders with the quick-change screw. 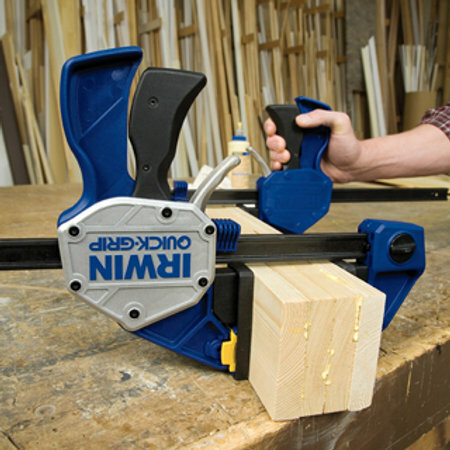 Although the spreaders need a minimum opening of 9-1/8″ to work, Irwin did increase the throat depth to 3-3/4″. It looks like Irwin will make the Quick-Grip XP600 in 6″, 12″, 18″, 24″, 36″, and 50″ lengths. We haven’t found anyplace selling these updated clamps yet. If you’ve seen ’em sold anywhere, let us know in the comments. Yes i have heard nothing but great things about these from other woodworkers. My father uses irwin clamps and I am in the market for some new clamps. Davedeli, just so you know you are not getting any pagerank increase from that link. Learn about a little thing called rel=”nofollow”. By the way, these Irwin clamps are pretty awesome! Wow, I’d never bothered to look at the page source, so I had no idea the links here were already nofollow’d (as they should be). I’d figured they weren’t, given how many spam comments show up. I have picked up several of the Irwin XP600 clamps in different sizes when I found them on sale at Lowes. These are by far the best clamps in my shop now. Strong, tough and easy to put in place. I plan to buy more. These are the first ones I grab. My only regret is I do not own enough and still have to use other style clamps on a larger projects. I have cranked down on them as hard as I can and they havent hinted at giving or slipping.